With a little bit of delay, I am adding to the list this report from Bucharest. Not to do an action only on my own, i have postponed the event from October 4-5th, to October the 11th. We were three people: myself, Daniela, and her daughter Veronica (11 yrs old), with a small banner with the picture of the Earth saying PEACE/PACE (English and Romanian), and with leaflets i have produced at the beginning of this month, spreading them among the visitors of the biggest park in Bucharest, called Herastrau. Initially we wanted to do this action at the University square, but we have changed our minds when we have seen the lack of interest of those busy people in the center of the city. So, we went to the park, where we noticed that people had more time to talk with us and read our leaflets. Inspired by Bruce's message, we went to those people and approach them our self instead of waiting that they will come to us and pick a leaflet. 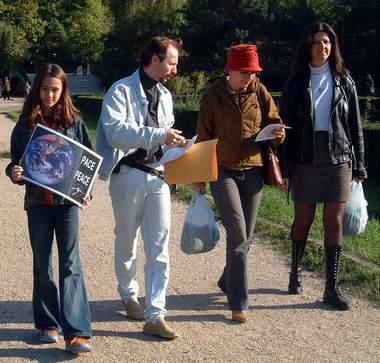 So, we were walking together with couples, groups, or singles that were in the park on this nice day of Saturday afternoon, talking about peace and peace in space. They do not realise that what is happening in fact is that we are getting more US military bases in our country and we are loosing our friendship with those countries that we considered friends before (at least from the economical and political point of view). As you could see in the news that people from GN have spread on our list, US military is trying to get more bases in East Europe, and to use countries like Romania and Bulgaria as places from where military actions can be performed against other states from further East.. So, i think these kind of leafleting action we did yesterday, is good at least for the fact that help those people we met to think deeper about all these things, and judge with their own minds. It was also good to see Daniela and especially her daughter Veronica being active and doing their best to make this little action a success. Hope Veronica will be more and more active in the future (this is actually her second action! ).